The Algerian Association of Experimental Animal Sciences is a scientific association. The founding members and adherents of the association pool, voluntarily and for a non-profit purpose, use their knowledge and their resources in order to promote and encourage the activities in the field of animal experimentation. – Rationalize and improve the use of animals at the service of human and animal health. – Codify the ethic of their use and make its principle better known. – Promote the use of animals in the research through the recognition of ethical principles and scientific responsibilities. – Undertake, as appropriate, any action deemed necessary to the defence of experimenters respecting the rules of ethics and the regulations in force. – Implement all the means intended to allow a quantitative restriction of their use. – Participate in the training and upgrading of researchers, technicians and users of animals. – Participate in the strengthening of the protection of ecosystems and biodiversity. – Encourage the research and promote knowledge concerning the biology and pathology of animals. – Promote a national harmonization in the care and use of animals. 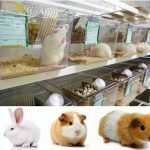 – Encourage the development of local animal models in order to contribute to resolving some specific problems in the country and region. – Develop interdisciplinary relations focused on animal and promote the national and international collaboration in the animal experiment science. – Share on a regular basis by mean of symposiums, working and communication groups all scientific and technical information relating to animal experiment and undertake all scientific activities to which it is related and in particular publication of a journal, bulletin and specialized books. 1- Committee of pedagogical animation, teaching and training (Dr. Samir SOUAMES, ENSV, Algiers). 2- Ethics committee (Dr. Nabila SERIDI, FSB, USTHB). 3- Committee of scientific and technical research (Dr. Rachida RAACHE, FSB, USTHB) . 5- Committee of external relationships and cooperation (Pr. Souhila AOUICHAT, FSB, USTHB). Contact : Science Home or Biological Science Faculty, USTHB, MB 32, 16111, Bab Ezzouar, Algiers.